Again, this is how I like my history lessons! Stories that take historical events and tell us what the poeple were doing and feeling during those events. I really really liked this book! I found Picture Maker on a shelf at the school coffee shop and I couldn't put it down. It's a story of a young Native American girl, post-Neanderthal but pre-European settlement. She is taken from her tribe by another tribe and is raped and abused. She flees from her captors and finds herself among the strange pale people of what would be Canada. She eventually makes a long and arduous journey across the ocean to Northern Europe and makes a life for herself, not of the people and not of any tribe. The story is not as depressing as I make it seem because she has this wonderful gift for drawing and observing the world around her. She is full of life, bravery, and adventure even in teh face of adversity. I felt more empowered and moved by this novel than by any other that I had read in year. Please read this book because it will make you feel a part of the larger whole. I was very moved by this novel. You cannot help but be entranced by the incredible pain and subsequent journey of Garahstah a.k.a. Picture Maker, the main character. You will cry and you will find yourself utterly amazed at the life and times of this young native American girl. The trials that she endures will break your heart and you will wonder how anyone survived in these times and in these conditions. While this book is fiction it does contain some well researched information about how life was being lived before Columbus came to America. It covers several different Native American cultures as well as "Greenlander" [Norweigen settlers:] through the eyes of a young Mohawk girl. I felt it was very well written and captured my interest right away. I read it almost constantly and enjoyed it very much. One of my very favorite books ever. It is jam packed with adventure,thrills, imagination. I feel like the author spent enormous amount of time doing research for this wonderful piece of art. The people of this time period went through so many hardships and trials, both natural and mankind. Their perseverance and bravery for surviving in this young girl was just awesome. Very interesting, well researched and written. Took awhile to get into it, and I took loooong breaks in between readings, but it was just wonderful. Really enjoyed it. Such an amazing journey and reading experience. This is a fascinating study of Northeastern Native American culture during the 14th-15th centuries A.D.. In this coming-of-age tale, Picture Maker, a young Iroquois girl experiences Algonquin, Naskapi, and Inuit culture first hand before she discovers her ultimate destiny in Greenland.Into this fascinating and romantic tale, Ms. Spinka intricately weaves the cultural traditions of each group of Native Americans as well as the history of the Norse in Greenland (as a matter of fact, the description of the Norse in Greenland has inspired me to eventually read Jane Smiley's THE GREENLANDERS, as discussed by Ms. Spinka in the "Author's Notes"). She capably shows the social and religious differences - both the good and the bad - of all the cultures discussed and truly makes the reader understand what it is like to "walk in another person's moccasins". This book is wonderful for gaining a deeper sense of cultural understanding and tolerance - I think older adolescents would enjoy this book as well as adult readers!...And I am really looking forward to reading the sequal DREAM WEAVER to discover the pictures that daughter Ingrid "draws" for herself. This was an interesting read about Native Americans,Eskimos,and the Vikings and beliefs that are so much a part of each culture. Makes you think about your own religion through the eyes of someone else's perspective. Set in the time when the Vikings first discovered America, a young Native American girl is forced into an odyssey which takes her from her own world into that of the Vikings. She must learn to adapt to her new life, and to lead the Vikings to an understanding of her life, as well. Well, it was interesting enough to keep me reading... but it was really already done with Jean Aul's _Clan of the Cave Bear_, which I read in 7th grade. I got this book for really cheap at a church book fair so it was good enough for the read at the price I paid. Not life shattering, though. I loved the depth of the mane character who goes through many different paths and thus names. It is compelling and there is a history lesson to be learned here. I thought that the novel became a little drawn out in the end but nevertheless the story will captivate you and draw you in. The story started out a little predictable, but i still found my self drawn to the main caracter. Glad i keep rading this one! This was a really interesting book that took alot of twists and turns. An american indian girl escapes and ends up living with the eskimos and ends up in Greenland. Really cool. Very good and interesting story of Native-North American peoples. Quite good actually. Ive had it for awhile, and picked it up out of boredom. A few chapters in, is when i fell in love with the character Picture Maker, and her adverntures. Did not finish.I wanted to like this book, I really did. The premise is so cool and I haven't read anything about Native American people and folkelore since...ever? But this book is just off. If I had to summarize why this book frustrated me, I'd say it's because it's just...flat. Characters are flat, plot is flat, writing is pretty flat too. Important plot events happened way too fast with barely any reflection by the protagonist. Horrible things happened to her very unceremoniously simply because other characters mentioned that sometimes those things happened. Quality of writing was just meh.Next time I read a book about Native American people, I'll be sure it's written by an actual Native American. I rarely read a book twice but this was one of the most mind-provoking books ever and I know someday I will read it again. Although I read it in 2002, it still rings in my mind as one of the greatest historical fiction books written. This book came to me via a charity shop on a chance outing, and i must admit, i was drawn primarily by the cover artwork which was reminiscent of my copies of the first three 'Earths Children' books. I was further convinced to part with £1.50 when i saw the statement 'In the style of Jean M Auel'. There are similarities that have been pointed out by various other people, and i compare them a lot in my review, that's mostly for the benefit Auel readers who looked/are looking to this series, or those who i think judged it too harshly. To really enjoy this book you've got to stop hoping for it to be another Earths Children novel. I wouldn't say Spinka and Auel have identical styles as eluded to by my copy, but there is parity in the descriptive and detailed nature between the two, and once i'd gotten over the fact that Picture Maker wasn't going to be another Ayla, i enjoyed the story a lot more. The book reads uniquely enough that you don't feel as though you're reading Clan of the Cave Bear again, although some people have said the plots are too similar, i disagree. Ayla's story was bound in 'what ifs' and 'maybes', whereas Picture Maker's draws more on known historical fact, and their early life, including how they leave their respective clans is in not really comparable. As the book progresses i found myself liking the protagonist more and more, and i found that unlike the Earths Children series, Picture Maker wasn't going through the story of her life on God Mode. She often didn't win at her attempts, she suffered greatly often with little change of vengeance, and she didn't radically change every culture she came across, which was a refreshing perspective on cross culture travel and one probably more realistic to life. On finishing the book, i immediately wished there was more, such had the characters captivated me, and it certainly lead me to seek out the second book straight away. If i have any criticism, it would be in the possible underdevelopment of some characters, with Picture Maker being one of them at times. I would liked to have known more about her own personal thoughts sometimes, and those of other central characters, as well as more about the mysticism of Native American and Inuit culture, but this was a minor niggle in comparison to how much i enjoyed the story overall. The story is set in the 1300’s when the Norseman discovered Greenland and Newfoundland. They established settlements or way stations along the Greenland coast. Picture Maker is a twelve year old girl who lives in the Ganeogaono (Mohawk) tribe, which is the most easterly tribe of the Iroquois nation. An Onondaga shaman wants to be the chief over all longhouse nations. His followers are a threat to several tribes including Picture Maker’s tribe. The men in her village leave to fight against the shaman and his followers. When the men return home, their village is attacked by some Algonquins and Picture Maker is captured. She lives with them as a slave but manages to escape and takes refuge for the winter with another Algonquin tribe. When spring comes, she travels to an Inuit village where she learns their language and adapts to their way of life. When a group from the village decide to travel across the water to Greenland and set up a home in an old abandoned Inuit village, she accompanies them. Through a series of events, they rescue a Norseman from certain death. She marries the Norseman and travels to the Norse village where she tries to adapt to their way of life. It is interesting to read about the different customs and beliefs of each culture as well as the history of that time. The book is well written and I was kept engaged throughout. It is an excellent book. Honestly, the only reason that I'm even giving this book 2 stars is because I like the author's writing style. Spinka writes in such a way that her descriptions are vivid, but not too "flowery" like Jean Auel's "Earth's Children" series. Her characters are developed and likable. I'm not sure how factually correct everything was, but I didn't notice anything glaringly incorrect in the story, and I liked the way she Spinka showed the similarities and differences between each tribe's customs and beliefs.What I didn't like was that within the first 100 pages, the plot seemed as though it was ripped right out of Auel's "Clan of the Cave Bear". I could understand if it was maybe one thing, but it seemed as though within that first part of the story, Spinka attempted to condense the 400 pages of "Cave Bear" and use it as the basis of the book. It's the story of Picture Maker, a Native American living in the Northeast US in the late 1300's, who is captured by an enemy tribe (rather like Ayla being taken in by the "flatheads"), and from there the similarities continue. I won't give them away if you want to read the story, but if I wanted to read "Cave Bear" again, I'd pull my dog-eared copy off the shelf instead of this. The fascinating story of a young girl, Picture Maker, in the 14th century kidnapped from her Ganeogaono tribal home and forced to become a slave to the Algonquins who call her people the Mohawks. She has the ability to draw pictures which sometimes have prophetic meaning. She escapes and travels to live with the Naskapi people. From here her journey takes her with the Inuit to Northern Europe where she learns a new way of life and language. It is here she meets Halvard, a Norseman, with whom she travels to his home in Greenland. Here they become embroiled in a battle between the new religion Christianity and the older traditional Norse beliefs and gods. Eventually she must flee to try and save her daughter from the separation she endured from her own family. A wonderful story which explores the culture and history of several Native American people groups, the Inuit, and the Norseman, and covers the Iroquois Wars, the Viking Invasion and the spread of Christianity in Northern Europe. I found it interesting because of the attention to small cultural details, like the fact the Ganeogaono women need to teach their babies to be quiet if they are hunting, and that Inuit culture sometimes included (uncommonly) wife-lending. Este es uno de esos libros que te dejan un eco, que resuenan en el corazón y en el pensamiento por largo rato. La historia de la niña que sabía dibujar es la historia de una mujer que se ve enfrentada a la violencia y la confrontación al ser capturada por la tribu enemiga en una incursión en la que ella salva a los suyos al avisarles de su presencia. Tratando de escapar y luego buscando su ser esta joven pasa por tribus de diferentes culturas mostrando que la humanidad y el respeto son las claves para consentir sin aplastar el encuentro con la diferencia. Su camino le muestra su conexión profunda con los espíritus y también con el amor, un hombre capaz de mostrarle que a pesar de las malas experiencias si es posible amar y ser amado. El libro me conectó con el lado indígena de Norteamérica y con esa espiritualidad siempre presente desde el Ártico hasta la Patagonia, pero también con la cultura nórdica y el encuentro de dos mundos mucho antes de que Colón descubriera América. 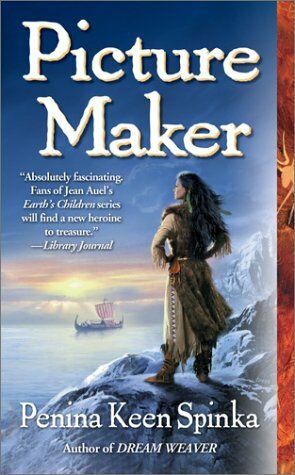 "Picture Maker" has the same shape as Ayla's story in "Clan of the Cave Bear" although historically it takes place in 1300s North America and Greenland instead of on the Russian steppes in prehistoric times. I found the story somewhat predictable and long, but enjoyed it nonetheless. Because our protagonist travels through so many lands and Peoples, it is an interesting study in comparative cultures as well as being a story about a resilient, independent woman-child who endures the unendurable and completes a cycle of storytelling that unites and makes sense of the history of discord among all the peoples she encounters. Well researched. A nice introduction into the names indigenous people give themselves and others. Interesting introduction to comparative technologies, food collection/production, housing, etc. Oh yes, and like Ayla she finds her man. I bought this book awhile ago and I'm regretting that I let it sit on my shelf for so long. This novel will make you laugh, cry and rejoice at every twist and turn it takes you on. Picture Maker is quite a remarkable young woman, and you want to reach out to her through the page and embrace her whenever she suffers the atrocities done to her. Though most would just roll over and die, she steams ahead and takes life as it comes to her, journeying from one tribe to another, learning the language and customs and making friends that will forever impact her life. Picture Maker, whose name changes with every tribe she lives with, never forgets where she came from, especially when she becomes and woman, and must remember all that her family had taught her to survive. This is a great book, stock full of adventure and good humor. A must read! I judged this book by it's sleeve description. Hungry to read about stories of a different time from my own country Canada, I took this book home. The first few chapters were slow moving but I persevered and truly enjoyed this book. She adapts to live with each group after she is taken captive after her village is attacked, and the reader is taken through the lives of so many different people's, learning about their lifestyles and traditions. As an accidental traveler, Picture Maker moves along Canada's east and northern coast joining and leaving different First Nation, Inuit, and Norse groups to survive and eventually learn how to thrive. This narrative really provides the reader with the understanding of how different each of these groups were to each other, the Algonquin, Mohawk, Inuit, etc. I will be looking for the sequel as mentioned on the sleeve description. This fascinating tale of a girl stolen from the only life she knew was a journey along the North East coast touring many different cultures. Through her struggles, Picture Maker gains a great understanding for the similarities between her original people and the others she lives with. All through the story Picture Maker makes friends, yet never feels she fits in. Is there a place far away from her home land for her?The characters were all well developed, as was the plot. I appreciated the attention to detail, as Penina's research was obvious. I adore her writing style, as the entire novel flowed very well without choppy points. Something about it drew me in and kept my attention throughout the entire book. I hope I can find the sequel at a store soon!